Looking for more offense from the shortstop position, Boston signed Lugo as a free agent to a four-year, $36 million contract in December of 2006. He hit just .237 during his first season at Fenway but he redeemed himself by hitting .385 in Boston’s four-game sweep of the Rockies in the 2007 World series. In 2008, Lugo’s defensive play faltered and when he couldn’t make up for it with his bat, he found himself splitting the shortstop position with Alex Cora. His frustrating tenure in Boston ended the following July, when he was traded to the Cardinals for outfielder, Chris Duncan. 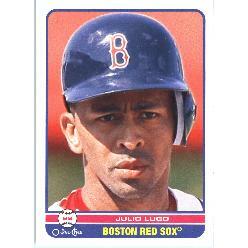 Lugo was born on this date in 1975, in the Dominican Republic.